Put it in your diary! Our Big Family Apple Day at the Shop and Memorial Hall Garden on Saturday 29th September from 12pm-4pm. We will have an apple press that will turn all your apples and pears into tasty juice. Remember to bring a bucket or suitable container(s) to take it home! A charge of £1 per 5 litres of pressed juice will be made to cover running costs. No apples and pears? No worries! Come with friends and family to celebrate the abundance of local fruit, watch the apple pressing, play our fun family games, try your luck in our big prize raffle, and find out more about your community shop. There will also be locally produced apple juice, cider/perry, and food too. Bacon bap/veggie sausage: £3 adults, £2 kids. Meal deals (incl drink): £5 adults, £3 kids, £15 family. Download the Big Family Apple Day poster. Are you overwhelmed with apples and pears? 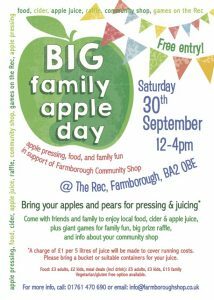 Then bring them for pressing, juicing, and drinking at The Big Family Apple Day on The Rec on Saturday 30th September from 12pm-4pm, in support of Farmborough Community Shop. 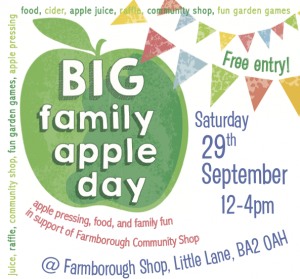 For more info, call: 01761 470 690 or email: info@farmboroughshop.co.uk, or download and share the Big Family Apple Day leaflet. Attending our events and donating what you can! We are located on Little Lane, Farmborough, BA2 0AH, behind Farmborough Memorial Hall. 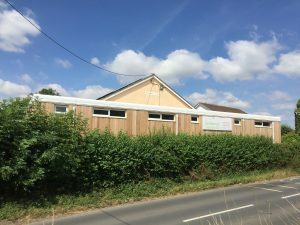 To access the shop, arrive at Farmborough Memorial Hall car park, walk through the gate to the right of the hall, across the patio and you will find us in the timber-clad building to the rear of the hall. Take a look at how the shop was built, from groundworks to opening on 30 June 2018.